Spring is finally here and the one thing on our kid’s minds just happens to be spring break. They look forward to it every year because it’s a week of no school of course! But just because they have the week off, doesn’t mean that we do. As working parents, sometimes it can be really difficult to take a whole week off to spend with our kids. Especially when you work for yourself, like I do. That means if I’m not working, I’m not getting paid. 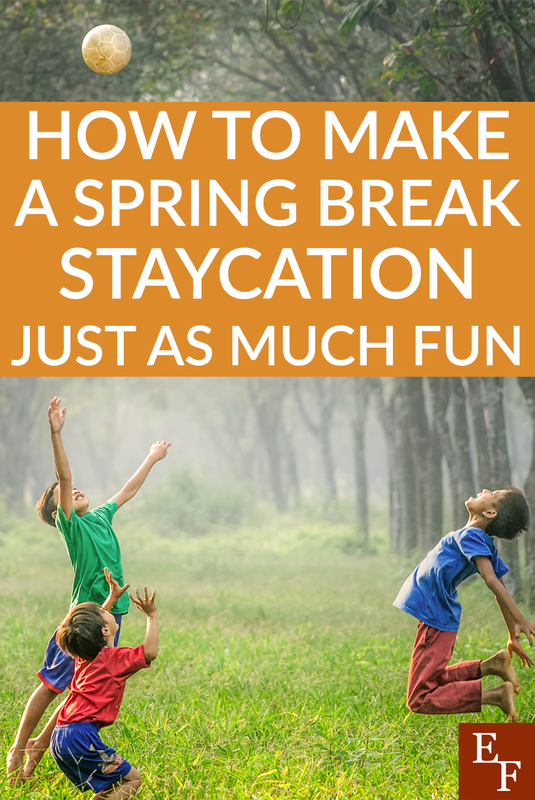 The bonus with creating a spring break staycation is that we can not only work in some fun stuff while we are working, but it won’t kill our budget either! Of course, there will end up being some complaining about not traveling. We do our best as parents to find the balance between work and play with our kids, and creating a staycation is no different. There will be some ideas they will mostly all love and some ideas that will elicit complaining. But, we just can’t win all the time! Naturally, we will shoot for the ideas that will keep them stimulated and entertained and that they will all hopefully love first. So that’s where we will begin. This is my favorite word in the English language and I use it almost ad nauseam. The fact that most people don’t know what it means, makes it more fun for us. Basically, it means the act of wandering aimlessly. Which, I am sure, sounds as if we are just wandering around bumping into walls, but that’s actually not it at all. Embarking upon perambulation excursions gives us a sense of adventure. We all crave that sometimes! This is one of our favorite things to do because it doesn’t cost us much, other than the gas to get there. So it stays within our regular budget since we are packing food from home that was already purchased as part of our normal grocery shopping. Plus, these adventures can be shorter or longer, so we are able to work them in when we both aren’t working. We have done some of these during the day and others at night, which creates a whole different type of adventure. So we really love adding perambulation adventures into our spring break staycation mix, and so do the kids! We are lucky enough to be surrounded by a plethora of museum options. Most of these are free to the public, which is a huge bonus! Sometimes there are some exhibits that have an entry fee associated with them. Luckily, we purchase an ASTC membership every year, which helps us offset the cost of these paid exhibits. There are over 300 museums nationwide that participate in this program. So you would need to find the closest museum to your zip code (or in our case we get to choose from 3 different options closest to us) and purchase the annual membership from them. Each museum has its own pricing and guidelines as to how the membership works at their establishment. However, the basic gist of the program is that if you purchase a family plan like we do, then both parents and their children can get into all of the museums in the program for a highly reduced cost or even FREE! I can tell you that every museum we have used this membership at has ended up being free for us to visit. Since we have a family with 5 kids, some of the participating museums have a child limit for each family. That is something to check if you are a larger family. Overall, we have used ours all over our state and in quite a few other states while traveling. This has really cut down on our costs, while still being able to give our kids a great time. The icing on top is that, for us, purchasing this membership every year is a tax write off because they are a non-profit association. Whether it is a tax write off for you depends entirely upon your specific situation and how you do your taxes, of course. Either way, the membership is pretty cheap to begin with and the rewards we reap from it. Whether staying local or traveling, it has been well worth the money, and the kids love checking out new museums! Working out in the garden is not something that all of our kids love, but it gets them outside and into the dirt. Which we love! Spring break is a great time to get the kids out in the garden and working hard for the food choices they each want this year. Since the weather is usually pretty decent during this time of year, it only makes sense to take advantage of the time off. Letting them each pick out a couple of crops they want to plant that will work in our garden, makes it more fun for them. Because we want them to learn to become responsible for growing their own food. This not only makes the end result taste better, but they are usually more excited to try new things if they had a hand in growing it. Plus, working in the garden is a great way to get kids to burn off some of that energy! The even bigger bonus that comes from growing their own food, is letting the kids get creative in the kitchen. Our kids are used to seeing us cook up a storm and we want them to have the same passion about what they choose to put into their bodies. So, using this extra time off during spring break is a great time to let them experiment in the kitchen. This is where they get to learn about science and flavor profiles, which are two pretty important components of cooking. Of course, we are also teaching them how to use the equipment properly, without hurting themselves or others. So life lessons abound! If you have multiple kids, getting them to team up and create a masterpiece concoction together is a good way to help strengthen their family bond also. If you are really lucky, some of their culinary creations might just end up being delicious! What are some of your best spring break staycation ideas?